Barry Hilton - When I began playing in the Grand Alliance period and heard about the 'Wild Geese' I was captivated by the story. I had never made the connection between the title of the movie starring Moore, Harris and Burton and the fabled exploits of Ireland's exiled soldiers in the service of France. That was in spite of the fact that Moore's character is called Shaun Fynn and Harris being of course, an Irishman! My friend of the time had Regiment Claire in his collection so I chose Montcashel's. Justin McCarthy, Lord Montcashel can be read about elsewhere in the blog (you'll find him featured prominently in the series In the shadow of history). Active early in the war in Ireland, Montcashel's Regiment were one of the battalions exchanged into the service of France in return for seven French battalions shipped to Ireland to brace the Jacobite Army. Their real story is that of the Irish Brigade in French service who fought with distinction and in one form or another were present in Napoleon's Army over 100 years later. The Wild Geese who flew away from home never to return to Ireland. I first painted the regiment in 1992. They were one of the few units composed mainly of Foundry models which I had at that time. I rebased and gave them new colours sometime around 1996 during the collection's major overhaul. During that refresh I made their coats much more vivid red and brightened the green of their facings. This was around the time when I switched from 40mm square flags to 50mm square. 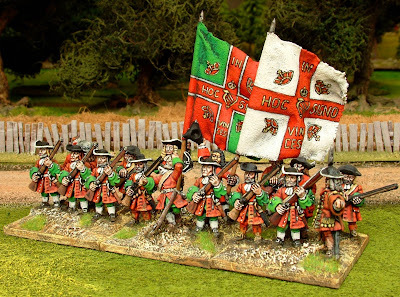 The flags on this version of the regiment I was particularly pleased with as they illustrate well the 'free hand on cotton' method which I developed over many years of practice and regrettably have little time to pursue these days. Their service record in my collection is impressive. They fought 64 actions achieving eight distinctions. Their average battle losses were a heavy duty 31%. The fighting Irish captured the colours of Kirke's Lambs on one notable day and they lost their own colours three times in their career. Their finest hour came in a refight of the battle which never was from the War of the Spanish Succession: Overjise 1703. We fought this game in Burnley in 1994. The Irish Brigade saved the French right flank from an attack by 4,000 grenadiers which appeared through the woods after a risky enveloping manoeuvre. Their darkest hour was an ignominious surrender at Kilbride (my home town in Scotland) during a fictitious scenario set in 1689. They gave up without a fight to Lennox's Regiment of Horse, a volunteer unit. 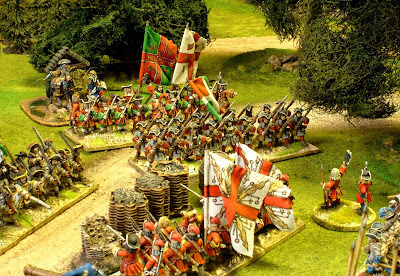 Regrettably during a 2010 reorganization of my collection I broke up Montcashel's Regiment, cannibalising parts to fill gaps in other formations. I still have most of the models now recruited into a less distinguishable Jacobite infantry formation which has made several appearances in League of Augsburg weekend games. 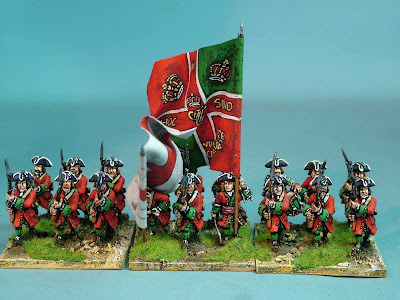 I painted the regiment again for Julian Blakeney Edwards. 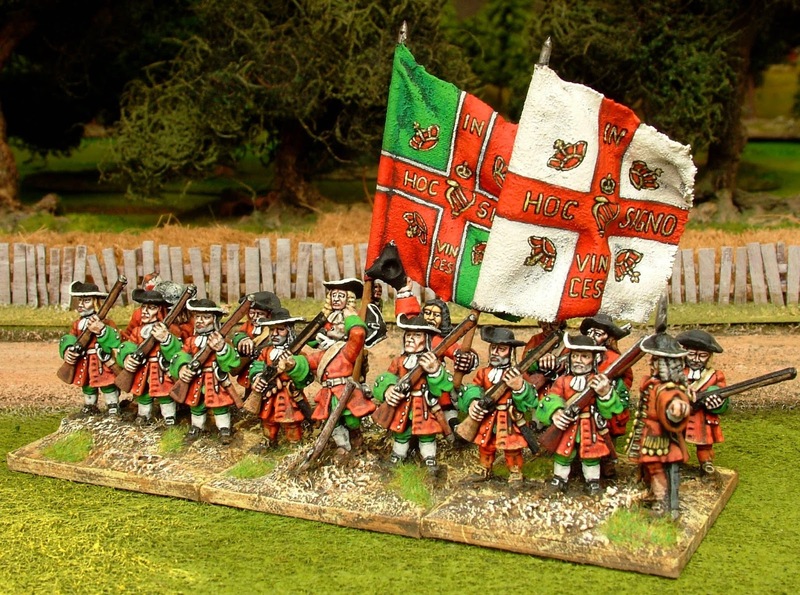 This iteration used Old Glory models and was dressed in tricornes for the WSS period. I think Julian has since sold them on. They were completed around 2003-2004.